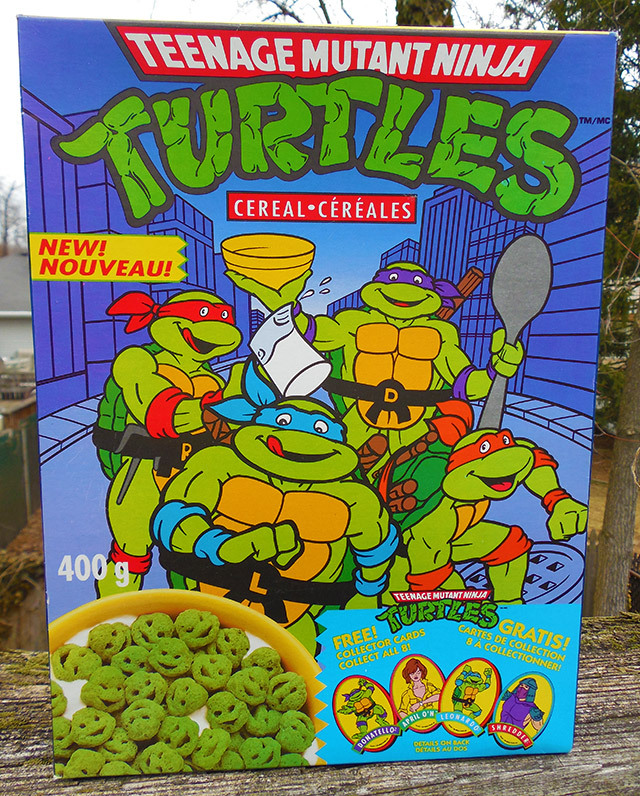 Ninja Turtles Cereal from Dimension X. | Dinosaur Dracula! 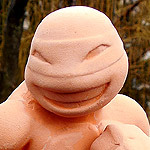 If I told you that today’s article was gonna be about old Ninja Turtles cereal, what would you expect? That stuff, right? 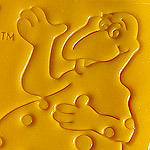 Ralston’s infamous Teenage Mutant Ninja Turtles Cereal, from 1989, or maybe 1990, or possibly even 1991. 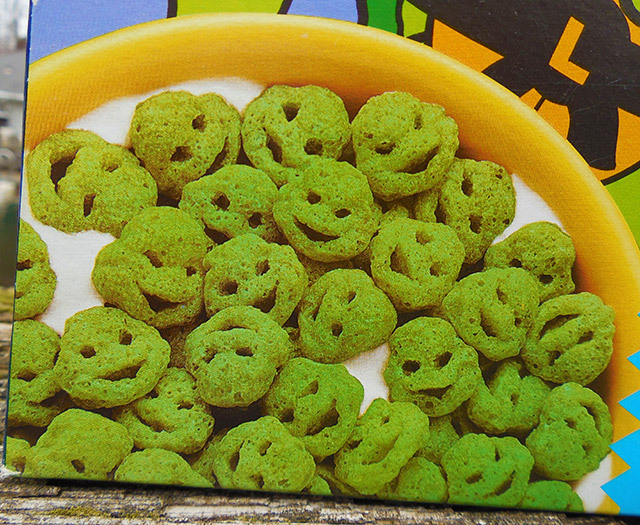 Adored by some, loathed by others, TMNT Cereal was nothing if not memorable. Mixing thematic marshmallows with Chex NINJA NETS, it was a cereal that I personally found atrocious. Chex was one of those “adult brands” that I was only supposed to eat when I was old and gray and in need of calcium. They couldn’t fool me by adding marshmallows. That just made it worse. It wasn’t until the first of my ten thousand TMNT Cereal reviews that I learned the truth: It did have fans. 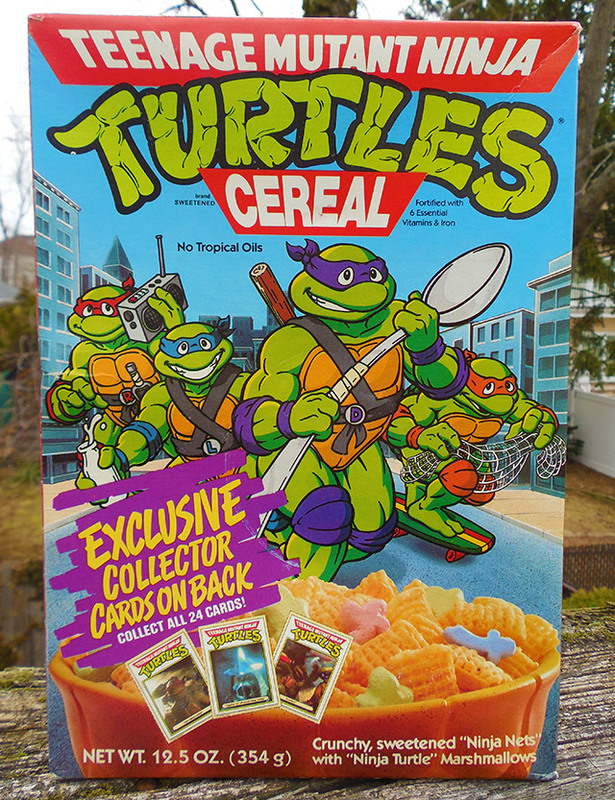 I only bought it because it was TMNT-themed and sometimes came with free plastic cereal bowls. Others genuinely enjoyed the taste. I won’t call them liars, but if I bet those people were… how can I put it? Changeable? Yes. Changeable. So concludes my trick opening, because today’s article is in fact NOT about Ralston’s Mutant Chex, but rather an ENTIRELY DIFFERENT old Ninja Turtles cereal. That one. It’s from Canada. I think it’s from Canada. Made by Nabisco in 1991, it’s like the cereal we grew up with, but from an alternate universe. So much is different, and yet, so much is the same. 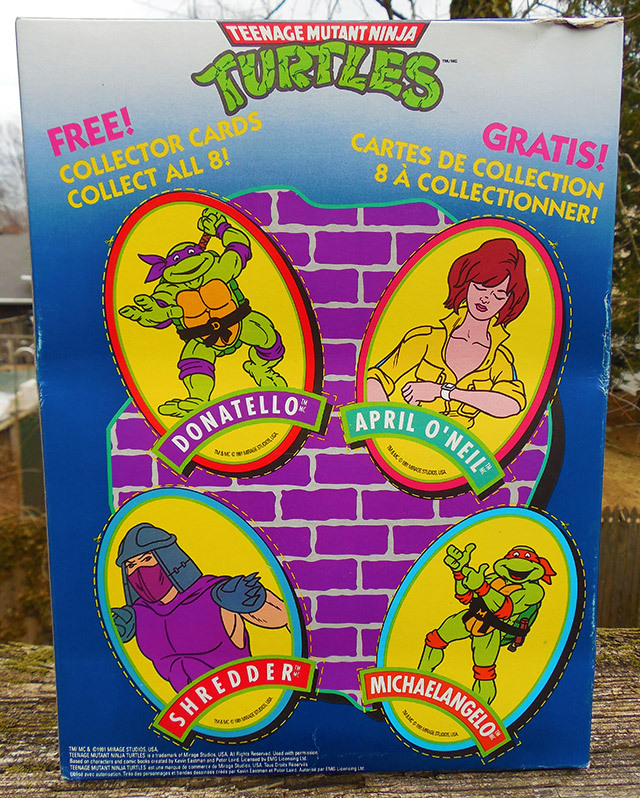 Compare this with the other box, and you’ll notice how the four Turtles are basically in the same positions, and are sort of making the exact same faces. It’s weirding me out. Plus, in the very definition of a smoking gun, DONATELLO IS HOLDING GIANT SPOONS ON BOTH BOXES. Even the city background has the same general structure! On first glance, you might never notice these similarities, because the differences are just so much bigger. 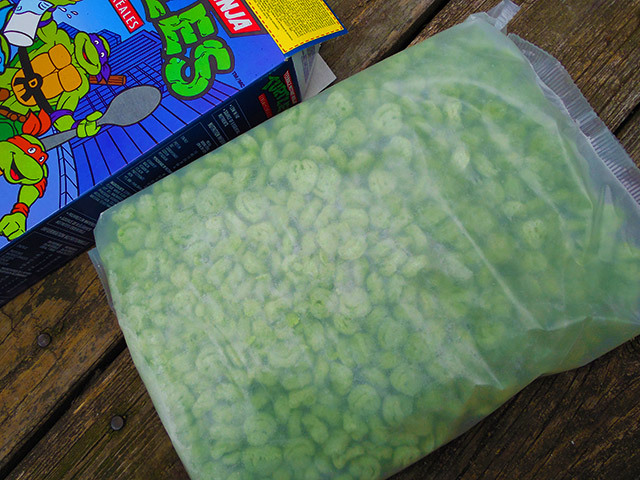 Chiefly, there’s the fact that we’ve traded marshmallows and Chex for GREEN CORN SHAPED LIKE NINJA TURTLE HEADS. 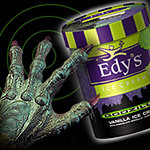 Besides, the front of the box gives us a clear indication of what’s inside, and what’s inside is marvelous. 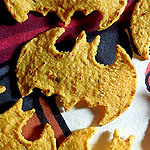 God knows what they tasted like, but those Ninja Turtle faces are completely adorable. Not halfway adorable. Completely. It just has to be SOME WORD rules. The cereal even came with a freebie. Several, actually. You could cut four “collector cards” off the back of the box, which were each shaped something like an upright Jesus fish. Suddenly Canada seems so much further away. Many curious art decisions surround these cards. If you’re going to make an April O’Neil card, great, but why show her lazily checking her watch? And Shredder? 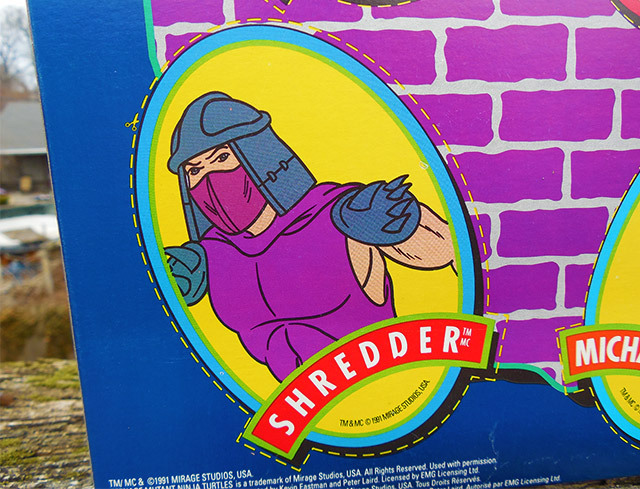 SHREDDER HAS NO RIGHT ARM. He has the spiky shoulder plate, but NO ARM. 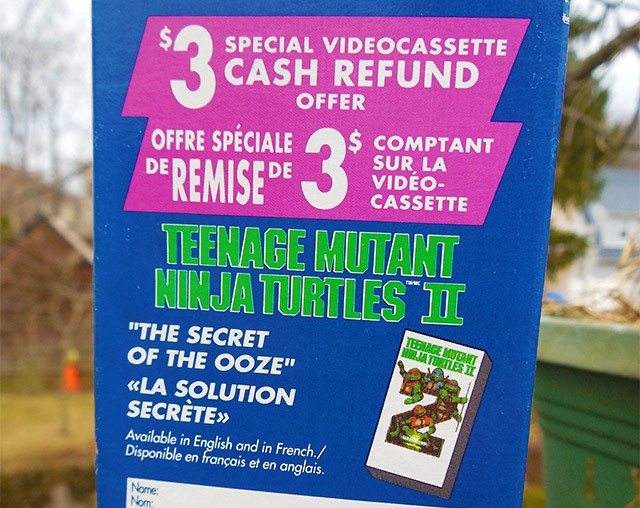 My favorite part of this whole thing is the promotion for Teenage Mutant Ninja Turtles II on videocassette. How else would I learn to say “The Secret of the Ooze” in what I’m assuming is French? I’m so torn, here. Which cereal was better? I hated the Chex-type Ninja Turtles Cereal as a kid, but from a purely artistic standpoint, I’ve grown to love it. It’s just so bizarre. I’m not sure if this Canadian version is better or worse. Really comes down to where your imagination rolls when you hear “ninja nets” and “disembodied Ninja Turtle heads.” There is no right answer. There is no wrong answer. Now imagine the both of them mixed together. How great would that be? So much of North America, represented in one wild bowl. 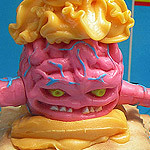 Chex, heads and marshmallows. I want that. I’m going to dream about that for the next three weeks.